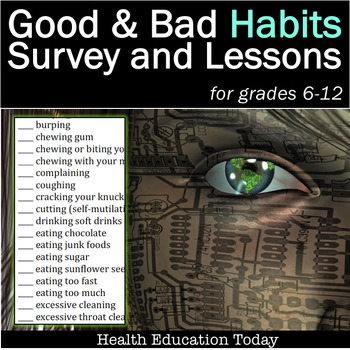 Habits Lesson - Cleansing Bad Habits and Creating Good Ones for Teens! Habits Lesson-★★★★ Cleansing Bad Habits and Creating Good Ones! 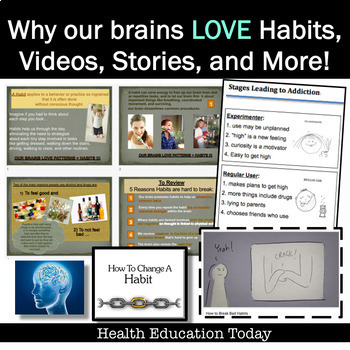 Our brain loves habits and patterns! This can be a blessing and a curse! 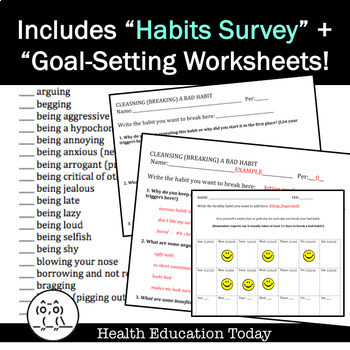 Help your students decide which bad habits to cleanse, which good ones to add, and then hold themselves accountable with a fill-in worksheet and check-off calendar to attain their goals. ★EVERYONE CAN IDENTIFY WITH THIS TOPIC AND LESSON! It’s familiar, informative, intriguing, fun, and challenging. Any teacher of teens could use this lesson! 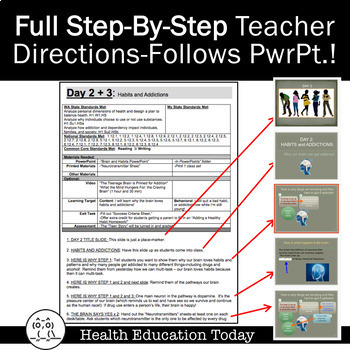 ★This lesson is taken directly from my Full Semester/Year High School Health Curriculum, which is the “#1 Best-Selling Health Curriculum” on the whole TPT website! ★Have you ever arrived in a room in your house with no memory of what you came to get? ★This is the essence of habits - once you start on a familiar series of actions, you stop thinking about them, and you’re able to complete them without conscious thought or attention. The good side is that habits free up our minds from dull or repetitive tasks. The bad side is that bad habits can be difficult to stop once they’re started. THIS IS A CRITICAL MESSAGE FOR TEENS! -32 pages of teacher directions that tell you what to say! 1. First, students learn how the brain sets up pathways to help us process information. 2. Next, students take a "Habits Survey" with 100 habits! 3. Next there is a video that perfectly explains habits and will help your students fill out the worksheets! 1. Students learn that the brain receives input from dopamine (Neurons begin to associate rewards with a particular thought, or action. Our brain says “Yes” to pleasure, and “No” to pain. People often turn to food, drugs, or alcohol to feel good or to not feel bad (and can then become "trapped" in addiction). 2. Students watch a video clip on how the brain handles the drug "Methamphetamine"
3. Students go through a "Neurotransmitter Handout"
4. Students take an anonymous “Drug Addiction Survey” to determine if they (or someone they know) has a drug addiction. Treatment resources are included. 7. When students finish their stories, they love to share them with classmates! Full Semester/Year High School Health (#1 Selling Health Curriculum on TPT! P.E. and High School Health Bundle - Save 15%! P.E. Middle School Health Bundle - Save 15%! THIS LESSON AND ALL ITS MATERIALS ARE INCLUDED IN MY FULL SEMESTER/YEAR PROGRAMS: "HIGH SCHOOL HEALTH" and "MIDDLE/JUNIOR HIGH SCHOOL HEALTH CURRICULUM," AND IS ALSO PART OF THE "TOBACCO UNIT." * Documents are editable and included in Word and PDF formats. * Ask your school district to purchase this curriculum for you! * Purchase Orders are accepted! 1 to 2-Week Badminton Unit-FREE! ***It’s fun to keep up on anything -*N*-*E*-*W*- that I post, so follow me by clicking the green star by my picture! Health Lesson: Habits - Cleansing Bad Habits and Creating Good Ones!